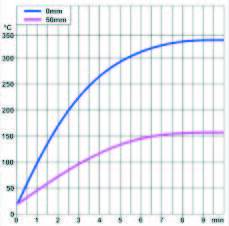 For a standard sheathed element, the surface temperature of 870 °C (1600 °F) is the maximum temperature to insure expected heater life greater than one year. These values are for information only, and data are provided for heating elements usgin Nickel Chrome alloy wire whose cross section is optimized, and which are insulated with good quality pure magnesia, not contaminated. This deterioriation of heating wires at temperatures well below their melting point is due to chemical reactions that occur at high temperature between the iron oxide (which is a contaminant of magnesia), and the wire itself. 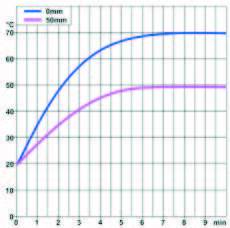 Note: When the sheathed elements are used in medium infrared radiant heating, this temperature of 870 °C (1600°F) is generally exceeded if the surface load is equal to or greater than 10W/cm² (60W/in²). This is the main reason of the short life expectancy of these heaters in this application. 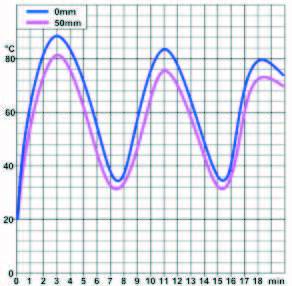 Temperture cycles of some tables are due to built-in temperature controls. Figures provided in this section are sresults of tetst made in our laboratory. Charts were smoothened by computer, and are given for specified power and for information only. 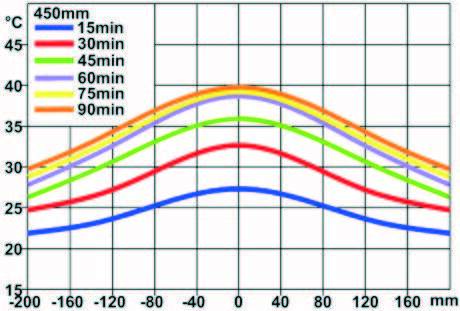 Infrared heater surface temperature VS wavelength Response time of different far infrared heaters (temperature stabilized at 440°C), compared to response time of a medium infrared heater (temperature stabilized at 700°C). There are many definitions of infrared and its division into far (long), medium and near (short), and often confusion is made between these different definitions. –The first is that of astronomy, according to ISO 20473 which defines the infrared radiation from the red edge of the visible spectrum at 0.780 micrometers (microns) up to 1000 microns. 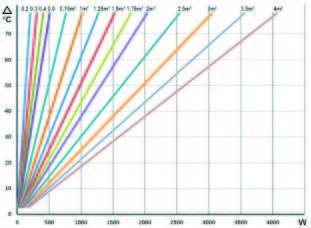 –The second is that of the CIE recommends that in the field of photobiology and photochemistry, cutting the infrared range into three zones: IR-A: 0.7 microns to 1.4 microns; IR-B: of 1,4 microns to 3 microns; IR-C: 3 microns to 1000 microns. 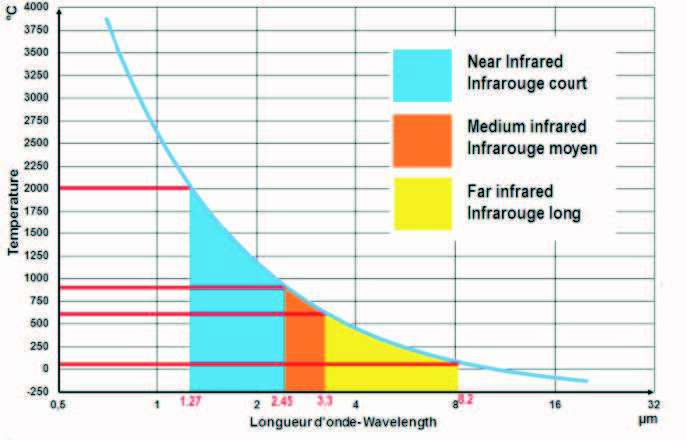 Far infrared, from 370 to 600°C, corresponding to a wavelength of 4.5 to 3.30μm. However, there are infrared emitters called “low temperature infrared” for space heating (heating ceilings, wall heating for saunas, convectors called “radiant” heaters), which operate at lower surface temperatures of about 70 to 80 ° C corresponding to wave lengths from 8.2 to 7.8 microns. – Infrared ceramic heater made of a ceramic encapsulated wire. 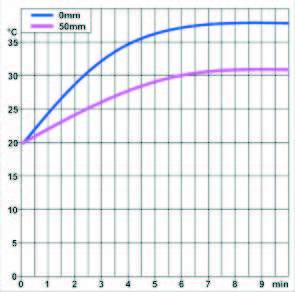 The surface temperature of the ceramic may range from 350 °C to 650 ° C. Because of their design and the low thermal conductivity of the ceramic used, differences in temperature up to 200°C on the emissive surface between bumps and groves, center and edges are possible. The resulting infrared radiation is distributed over a large wavelength range. In addition, a large percentage of the radiation emitted on the rear face of such elements, only serves to heat their support. The ceramics used to make these elements have a low emissivity in the far infrared, so, an additional percentage of the energy is dissipated in the different wavelengths. To overcome it, some of them are now covered with a black glaze. 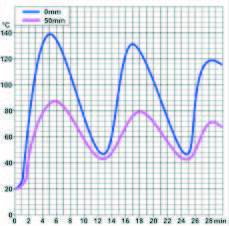 The time to reach 90% of their operating temperature, starting from 25°C is approximately 5 minutes 40s). 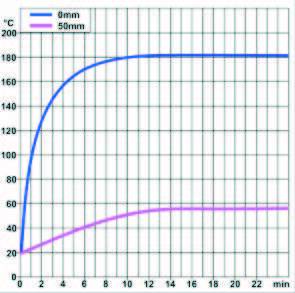 –Sintered silicon carbide tube emitters: they reach an emissivity close to 100% in the 3 to 4 microns wavelength, corresponding to 450 – 690°C (840-1280 ° F) surface temperature. 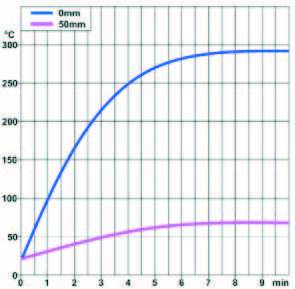 The time to reach 90% of their operating temperature, starting from 25°Cn is about 3 minutes 30 seconds. – Sheathed tubular elements: usually consisting of a tube made of Inconel, specially oxidized to give it a better infrared emissivity. The tube surface gives a dark red visible radiation. Their surface temperature range from 450 to 600°C. 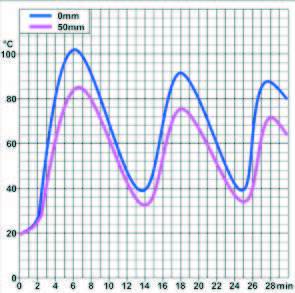 The time to reach 90% of their operating temperature, starting from 25°C is about 5 minutes 30 seconds for a 10 mm dia. tub. (About the same time than a ceramic radiant heater). – Quartz tube elements, in which a wire coil, made of chromium nickel, carbon, iron-nickel-chromium or tungsten, is placed in a milky surface quartz tube. These tubes are open at both ends, and in contact with atmospheric air. They have a surface temperature of 700°C to 1000°C; Particularly economical, but fragile, with a limited life of about 5000 hours for the heating wire reaching high temperatures in air where they are quickly oxidized. 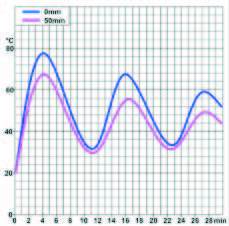 The time to reach 90% of the operating temperature, measured from 25 ° C is approximately 1 minute 20s). – Tubular sheathed elements, similar to those used in the far infrared. The high surface load gives a visible red light. The surface temperature of these components is in the range of 700 ° C to 800 ° C.
The time to reach 90% of the operating temperature, measured from 25 ° C is approximately 2 minutes 40s. This radiation source is constituted by an incandescent tungsten or Iron-Chromium-Aluminum filament in a quartz tube filled with nitrogen or argon and, optionally, depending on the model, a small percentage of halogen gas. 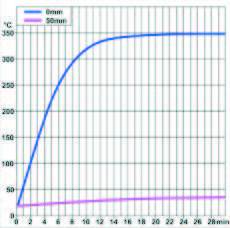 The filament is heated to an average temperature of 1800°C. (Some up to 2500°C). Originally developed for applications in lighting, they emit a portion of their radiation in the far infrared, as a part of the emitted wavelengths in the visible spectrum and in the near infrared is absorbed by the quartz and converted in far infrared by the silica-oxygen chemical bond. Their inertia is very low (a few seconds). These tubes must be cooled. Materials are selective as to the wavelength accepted to absorb infrared energy. 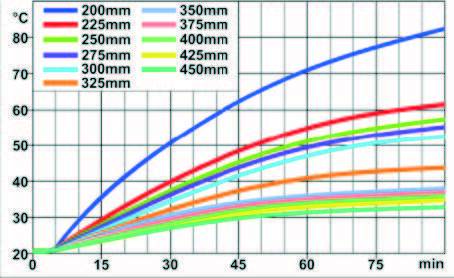 Most of materials show a peak of absorption between 3 and 4 microns (μm). 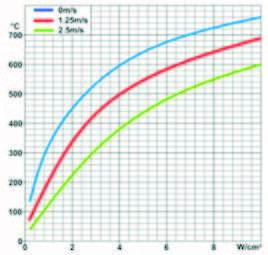 For example, if the product to heat has an absorption peak at 3.5μ, the heating element surface temperature should be: (2897/3.5)-373 = 555°C, or (5215/3.5)-459 = 1031°F. This rule applies no matter what the construction of heat source. 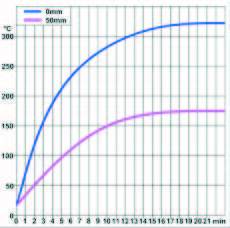 Hence, filament bulb temperatures being very high, they will radiate in the near infrared, sheathed incolloy heaters with temperatures of 600 to 700 ° will radiate in the mid Infrared, and ceramic heaters with 400 to 500°C surface temperature will radiate in the far infrared. 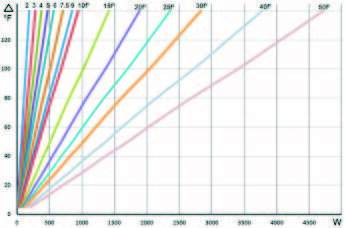 What will make the difference in the final efficiency is the percentage of power supplied to the heating source that will be converted in the required wavelength. 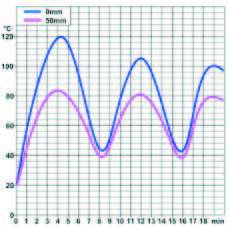 This also means that it is possible to adjust the wavelength peak of a radiating source by controlling its surface temperature, e.g by adjusting the voltage or controlling the power, and mainly using heaters materials with the best emissivity in the requested wavelength. 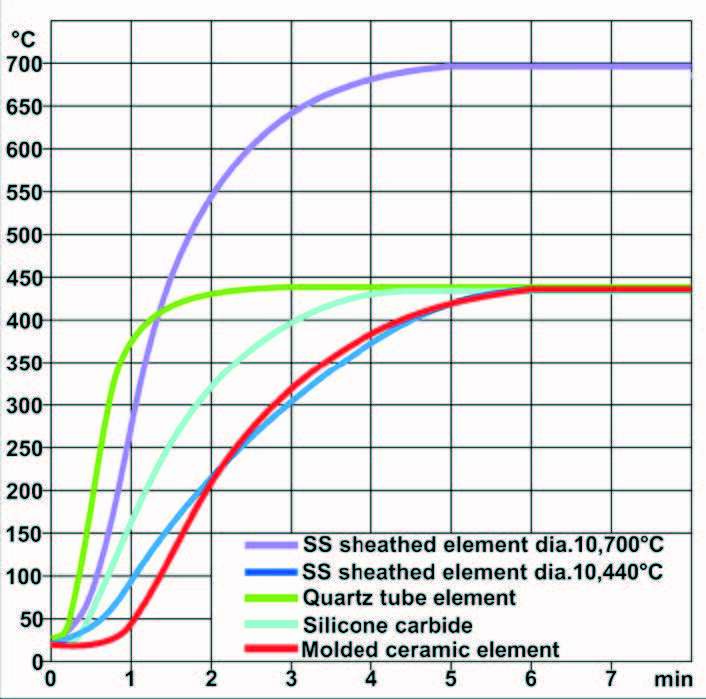 Sintered silicon carbide tubes reach a radiance near 100% equivalent to a blackbody) in the 3 to 4 micron zone corresponding to 450 – 690°C (840-1280°F) surface temperature. 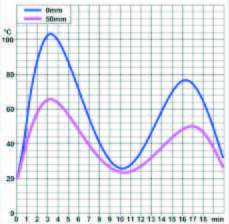 Absorption peaks are wavelengths that are the most converted in energy inside the material and will result in its heating. Tests carried out by subjecting a 30mm thickness sample of synthetic material (methylcellulose gel) having a UV behavior close to food. 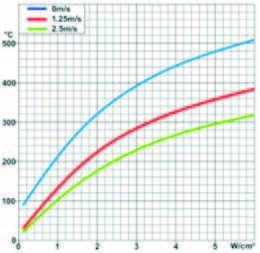 Test made from different distances, by measuring the sample temperature at 10mm deep. Tests were made with silicone carbide infrared heaters 9MH described p19 in this catalog. The distance is measured from the edge of the reflector to the surface of the sample. Sample temperature is 20°C at the start of the test.